Demelsa is a painter of whimsical and magical imagery. From the bright setting of a tiny ladybird village (complete with corner shop) to the gloomy darkness of a forest filled with gnarly trees that were once children... her work creates a sense of wonder and gives a snapshot of imaginary worlds and characters, often with an injection of quirky, subtle humour. With a lifelong love of traditional stories, and anything magical or supernatural, she is influenced by stories far removed from real life and endeavours to capture this in her paintings. An early memory that perhaps influenced this was being convinced she had seen a two headed llama at a zoo visit. Embarrassingly, she continued to believe this until well into her teens. It was a sad, sad day when reality became real. 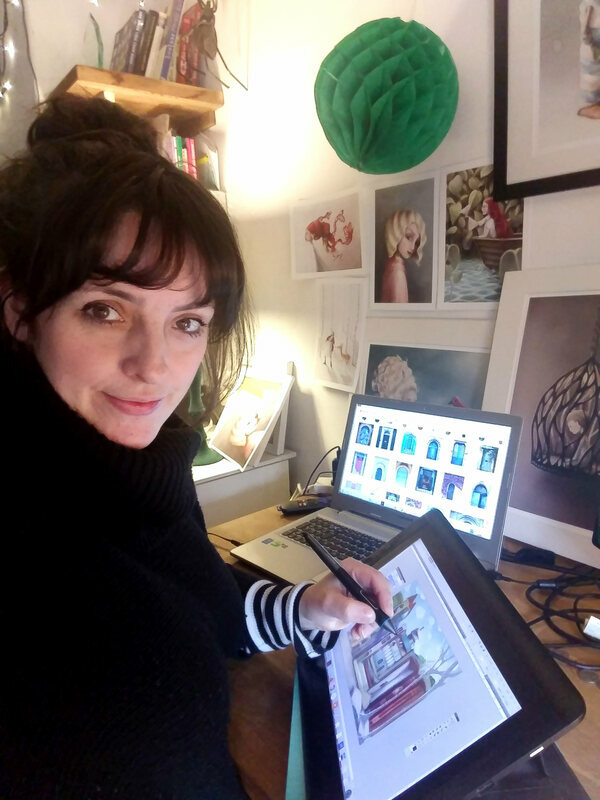 Spending much of her 20's painting with traditional methods, she was introduced to the basics of Abobe whilst acheiving a 1st class BA (honours) in Fashion Design and Production. She now paints all of her art in Photoshop on a Cintiq (a Cintiq is a graphics tablet and you use a digital pen to draw directly on the screen). She starts with a pencil sketch and then scans this to continue working on digitally. As all her work is digital there is no 'original' as such, but the freedom to be more experimental with composition and colours without the fear of ruining a painting is a great bonus, as is the ability to easily create prints and cards of her work without the need for additional scanning or photography. As well as producing prints and cards, Demelsa also illustrates children's books, most recently a retelling of six Hans Christian Andersen fairytales for a French publisher, and she is currently working on several jigsaw designs for Ravensburger. Demelsa lives in North Yorkshire (UK) with her partner and their 3 children.